Floating on the surface of the water in the National Marine Sanctuary, off of Key Largo in the Florida Keys, my breathing is deep and relaxed as I prepare for my next freedive. I slowly move my hands back and forth below me in a lazy effort to pop the discarded scuba bubbles as they dance to the surface in erratic shimmery patterns. The blue water had moved over the reef from the Gulf Stream, and from up here I have a prime and expansive view of the eight newly-certified teens cruising the finger reefs 30’ below near the bottom. The Colorado-based students range in age from 14-17 years old, and each is on scholarship and earning their open water scuba certification as part of TIDES - a youth marine science program through Ocean First Education in Boulder, CO. The scholars are also the focus of the related documentary web series, A Rising Tide. 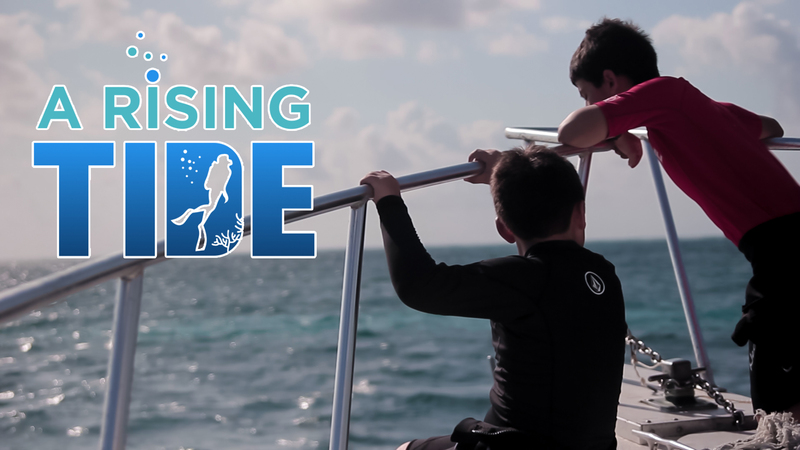 The series chronicles their watery journey and allows them to share their experiences, challenges, mistakes and all, with other youth and viewers around the world. Recently this past year, I came on board in collaboration with Ocean First and New Focus Films, to assist with the web series as an Executive Producer, the Series Host, and to work with the students in the capacity of a mentor. Just a few days earlier, we had traveled as a group to the Florida Keys to finish out their certifications. They all passed with flying colors and were now proudly engaged in their first autonomous scuba dive. It’s hard to believe that just a few months ago, two of these students had never been on an airplane, one did not know how to swim, and none of them could say that they had been diving in the ocean! Now the students were moving freely underwater with the awkward grace expected of newly-initiated water people. As I watch them explore and play, their eagerness and excitement is palpable and contagious. I think of Edward Abbey’s philosophy on the importance of taking the time to enjoy the places you’re working and fighting for. In this moment, the students are forming a connection and partnership with the sea, like I had done nearly three decades earlier not far from where we’re diving today. I grew up in the Florida Keys, on a rock smack dab in the middle of what would later become the Florida Keys National Marine Sanctuary. Growing up with the constant exposure to the ocean and freedom to endlessly play there, cultivated in me a deeply-rooted connection to this magical underwater place. With this connection, came a strong sense of ownership and responsibility to it as well. I didn’t know it back then, but this connection is what would become the foundation and, ultimately, set the course of my life and work built around the sea. Establishing the first constant weight freedive record for the US, followed by a Biology degree from CU Boulder, has taken me on an eclectic journey of specialized underwater work as a stunt diver, model, television personality, expedition leader and marine educator. In working with these enthusiastic teenagers on A Rising Tide, I’ve combined my skills in the water and on camera, with my passion for marine science, conservation, and working with youth. Getting to share in this experience with them as they forge their paths forward has been nothing short of amazing for me. Over the course of this one short semester, these kids have transformed. They’ve gained access to the ocean, learned about ocean issues, and expanded their horizons and thinking as to what is possible for their future. As unlikely as it seems in land-locked Colorado, we’ve all found each other and tapped into the thriving inland ocean community here. Being this far from the ocean can give new perspective on our connection to it, and the realization that no matter where we live, what we do in our daily lives has an impact on the health of the ocean. With any luck, and with more experiences like this, the students will develop their own sense of ownership and responsibility to our oceans. At very least, they now know the connection and are armed with new knowledge on the issues facing our ocean planet today. They have felt the inspiration and magic of being and playing underwater. With this, I feel hope for the future and a deep sense of pride in working with these students, and more to come, who are bound to be part of the next wave of our ocean warriors. I pack in one last deep breath, break the surface, and my heart soars as I freedive down to join them on the bottom. “A rising tide lifts all the boats”. This means that as more problems are solved, everyone benefits. We didn’t know a lot about any of the kids selected to be our A Rising Tide scholars.